I nominate this song, first sung in the late 1800s, as the BEST Christmas song ever written. Why? Because it tells the simple story of the birth of Jesus and it refers to him as “Lord.” Why is that important? Because it is an appellation that belongs only to that little baby who grew up to live a perfect and sinless life, die on a cross for the sins of mankind, be buried in a tomb and then to rise again from the dead three days later. 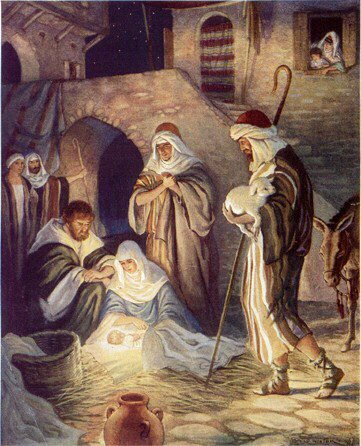 It all proved that “the little Lord Jesus asleep on the hay” really was and is Lord of all. No wonder we sing that song with such reverence and awe. It reminds us of the story of God’s love for you and me and how far He is willing to go to tell us how much he loves us. But that’s not the title of this article. The title says you are going to read about the ten WORST Christmas song ever written. So let’s get on with it, shall we? 10 – “I Saw Mommy Kissing Santa Claus.” I think the Jackson 5 recorded this song if memory serves me right and it sounded pretty good. But let’s face it: no one likes a snitch so it makes the Top 10. 9. – “Do you Hear What I Hear?” By Bing Crosby. Now I know many of you are going to ask, “So who’s Bing Crosby?” but I don’t have the time to explain it to you. I put this song on the list for one big reason: it is boring. 8. – “The Little Drummer Boy.” What does “Pa rum pa pump um” mean? I’m just not sure and then there’s the fact that there was no “little drummer boy” in the Christmas story so some guy just made it up and inserted him into the nativity. 7. – “All I Want for Christmas is my Two Front Teeth.” When Mariah Cary recorded this one as a duet with Justin Bieber it was cause for entry into the Top Ten Worst. 6. – “Love on Layaway.” I was in WalMart when this one came on and I thought what a great song for shopping! Yuck. 4. – “All I want for Christmas is YOU!” This song sung by Mariah Carey is loud, noisy and selfish. Doesn’t sound like Christmas to me. 3. – “Baby it’s Cold Outside” – This isn’t a Christmas song at all, it’s just played during the season. It’s silly and smarmy, and when I hear it sung by the two guys in the “Glee Cast” version, it is down-right creepy and before they are done, I get nauseous. 2. – “Santa Baby” by Madonna. Come on, we all know Madonna is a complete fraud as a singer. Eartha Kitt’s version was sweet and gentle, but we all know that Madonna can’t sing. And what’s with these words, “Santa Baby, just slip a sable under the tree for me?” Madonna wants a fur for Christmas? I thought she was some kind of an environmentalist? First of all, parents use this song to parent instead of parenting themselves. What parent hasn’t repeated the words of this song to get their children to shut up or stop fighting or clean their room or do their homework? Second, it teaches children that Christmas is all about getting more stuff and has nothing to do with giving. What do we think Santa does most of the year and especially in those fast-moving days between Thanksgiving and Christmas Eve? He’s making a list and checking it twice! It makes it look like Santa is some kind of cosmic bully with a clip board running around taking notes of every nasty thing children think or do. Every kid knows that if you want some really good stuff you better buck up and behave yourself because Santa’s got stuff! They’ve all seen Santa’s workshop and they can name several of the elves he hires to make toys and candy and all those fun things advertised on TV. Heck, I want to be on Santa’s list, don’t you? The third, and most important reason this is the worst Christmas song ever written is because in young children’s minds Santa Claus is an early surrogate for God. knows when you’re awake and knows when you’ve been bad or good” is God and for at least the month of December, Santa is an acceptable alternative. So does this song teach children that God is loving, kind and forgiving or that he is grumpy and judgmental? Lots of people have the idea that God is out to get them – could that idea have taken root when they learned this silly song? The song positions Santa as some sort of clairvoyant giant Gotcha god hiding behind some curtain or lurking in the darkness just waiting to catch you doing something you shouldn’t do or thinking something you shouldn’t think or saying something you shouldn’t say. So in their most impressionable years God becomes this judgmental, hypercritical ogre who is impossible to please and who is hell-bent on stifling every fun thing anyone wants to do! After all, what fun is it to always be a good little boy or girl? Every kid wants to use some of those nasty words Uncle Bill uses when he works on his car. And what kid doesn’t want to take something that’s not theirs or try to do some of the things they watch big people do in the movies or on TV? Kids learn early that it’s impossible to be good enough to please Santa Clause to the degree you get everything on your Christmas list. Why? Because He knows everything – even those secret things no other person on earth knows. And that is a characteristic of God. It’s called omniscience and it means infinite knowledge. 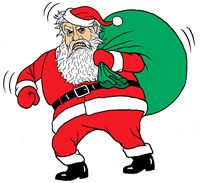 Guilt and fear, the basis for “Santa Clause is Coming to Town”, makes us think that God may be mad at us. But he isn’t mad at us, he loves us. Because God loves us we don’t have to be afraid of Him when things go wrong; but rather we can run to him with our fears and guilt and with our deepest sorrows and find in him the peace and joy that some of the best Christmas songs celebrate. And stay by my side, ‘til morning is nigh. And take us to heaven to live with Thee there! Read Dr. Ross’ blog: www.RonRossToday.com.